In the last ten minutes, Eagles ruckman Nathan Vardy has won seven of twelve hitouts. Critically, four have gone to the direct advantage of a teammate. Marc Murphy's 710 metres gained is easily the most of any man of the ground. Next best is Eagle Sam Mitchell with 457. West Coast has the final term advantage in inside 50s ten to two. However, both sides have kicked just a single goal each. Blues InterchangeDennis Armfield off due to an injury. Going into this round, the Eagles Josh Kennedy had an average of 3.9 goals per game, comfortably best in the AFL. His five goals so far tonight leave him tied with Joe Daniher of Essendon for the most kicked in the league in 2017. Blues defender Jacob Weitering is the only player to have not been interchanged tonight. For the third term, the Blues won the disposal count 114 to 77. Their disposal efficiency in that term was 82 per cent compared to the Eagles 70 per cent. Four of Carlton's five third quarter majors have been sourced from a West Coast turnover. Carlton's Sam Kerridge has eight disposals at 80 per cent efficiency for the third term. This gives him a total of 20 disposals for the game at 80 per cent. Marc Murphy has a gameleading eight score involvements for the Blues, including kicking 2.1 himself. The most for an Eagle has been six score involvements for Jamie Cripps. After their final seven inside 50s of the first half produced four behinds, the Blues first inside 50 of the second half results in a goal. 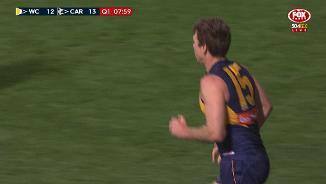 Five of West Coast's nine goals have been from inside a distance of 30 metres. In contrast, all three of the Blues goals have been from beyond 30 metres. After Carlton lead by 12 points early in the game, West Coast has kicked nine of the last ten goals. In the last ten minutes, West Coast has disposed of the ball at 74 per cent efficiency compared to Carlton's 46 per cent. In this time, they have also kicked 4.1 to 0.1. Jack Redden with just his second goal in his fifteenth game for 2017. The Blues have given away five free kicks for holding the ball, to be their mostcommon indiscretion to the point. Matthew Kreuzer holds a slight edge over Nathan Vardy in headto-head ruck contests, 11 to 10, and hitouts to advantage 4 to 3. 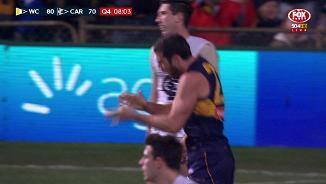 Four intercept marks for West Coast's Jeremy McGovern equates to one third of the game total across both teams. The Eagles and Blues each have six total. The Blues closed out the first term with nine of the last ten inside 50s. However, they did not take full advantage of this dominance, only outscoring West Coast 1.2 to 1.0 during this period. Three goals for Jamie Cripps matches his seasonhigh, which he achieved in the Eagles Round 1 victory over North Melbourne. Matt Priddis' seven disposals place him atop the leaderboard to this point. The Eagle midfielder is also responsible for three of his teams seven tackles. In his fourth season of AFL football, Jeremy McGovern is averaging a careerhigh 7.6 marks per game for West Coast. With four at this stage of the game tonight, he is well on track to eclipse this mark. Carlton has six of the first seven clearances, including three to Matthew Kreuzer. 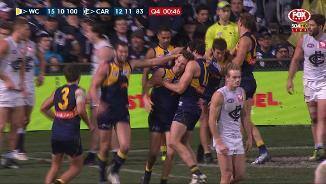 West Coast has already given away three free kicks for holding the man. Carlton captain Marc Murphy opens the scoring tonight with his tenth goal in 20 games for 2017. Of the Blues scores this season, 65 per cent have been made from an intercept, the highest percentage recorded by a side. West Coast has scored 17 goals this season coming directly from its kickin chains, the second-most by any side in the competition. Welcome to Domain Stadium for the West Coast Eagles v Carlton Round 21 clash. PART one of West Coast's trilogy of season-defining games didn't exactly go to script but the Eagles dodged a potentially lethal bullet against Carlton, winning by 17 points to stay alive in the finals race. 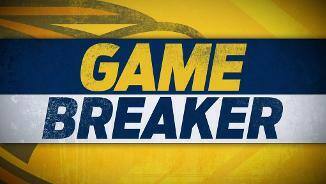 Few gave the Blues – riding a bumpy seven-game losing streak – hope of seriously threatening West Coast but Brendon Bolton's plucky outfit pushed the hosts to the brink of disaster before falling short 15.10 (100) to 12.11 (83). The Eagles breathed a huge sigh of relief at the final siren, having led by as many as 35 points in the second quarter and then watching as the never-say-die Blues hit the front after a barnstorming third term. 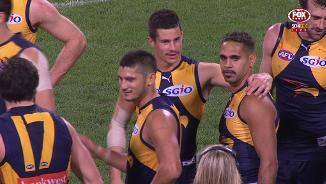 Anxiety swept through supporters during the fourth quarter – amid real concerns over West Coast's awful recent history of fadeouts – however the Eagles found just enough to scramble over the line. With a blustery breeze at their backs they kicked five goals to three to notch their 11th victory and move into seventh spot on the ladder. "It was sort of a game that we thought would be a little bit like that. 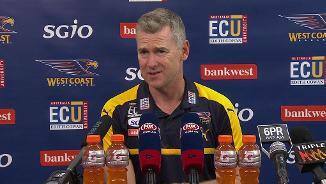 The way Carlton have been playing for most of the year, you'd say that they've been in almost every game at stages," Eagles coach Adam Simpson said post-match. "But it was disappointing for us in the third quarter - I think we conceded five or six goals in a row almost - and our inability to shut that down and stop their uncontested play, which we knew they would come with at some stage, was a concern." To their credit, the brave Blues made a mockery of suggestions they will be easily leapfrogged by the Lions and win another wooden spoon. For West Coast, superstar spearhead Josh Kennedy was again the difference, bagging six goals to move one ahead of Essendon's Joe Daniher in his chase for an historic third-straight Coleman Medal. 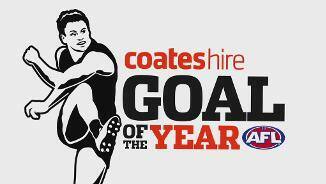 Kennedy has booted 26 goals in his five games since coming back from a calf strain, and has 60 for the year. That he is even still in the Coleman Medal hunt owes to his ability to feast when others would starve. West Coast's battles with a lack of forward supply continued to plague them on Saturday night, with Carlton winning the inside 50 count 54-46. Criticised in some quarters for a methodical gamestyle, Bolton released the shackles and his young outfit relished the freedom. The Blues were switched on early, bringing the heat (18-13 tackles), dominating inside 50s (18-9) and capitalising on the strong breeze. Marc Murphy and Bryce Gibbs' classy finishes silenced the 30,491-strong crowd, and predictions of Carlton's star midfield trio getting on top were becoming reality with Matthew Kreuzer (17 disposals, 33 hit-outs) in total command of his ruck duel with Nathan Vardy. 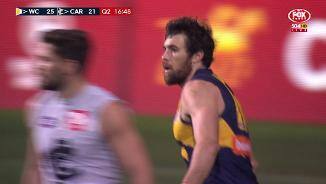 But the Eagles lifted around the ball and - although Kennedy was held statless by reborn defender Liam Jones - everything goalsneak Jamie Cripps touched turned to gold. Cripps booted three first-term majors, equaling his best return for the season, as the home side edged ahead 24-21 at the break. Then it was Kennedy's turn to get off the chain in the second quarter. The dual Coleman medallist broke Jones' shackles with three majors and the floodgates burst open. 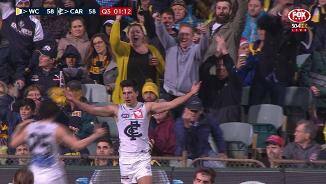 Carlton missed four golden opportunities to bridge the gap before half-time – then Levi Casboult rubbed salt into the wounds by passing instead of taking a set shot as the siren sounded – and from 31 points down the Blues looked shot. However, Bolton's men had other ideas. A third-quarter built on swarming pressure and gutsy run-and-gun football stunned the hosts. 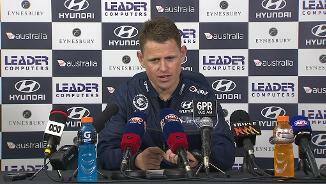 "I thought at times we opened up our ball movement a little bit more," Bolton said post-match. "We've been trying to do that for a while, but players executed a few of those plays. "They'll look at those and get some more confidence from it, because defensively they're doing a lot right." 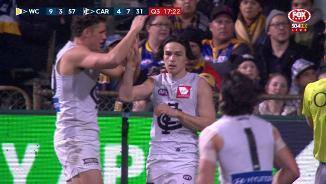 Carlton exposed West Coast's lack of leg speed and the Blues piled on six unanswered goals to hit the front by six points, with Jarrod Pickett and Jack Silvagni (two goals) leading the charge. 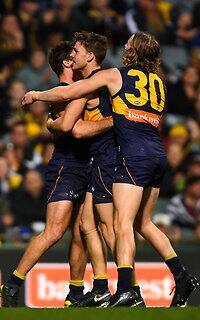 However, Kennedy's fourth steadied West Coast's ship and levelled scores heading into the final term. Retiring Eagles veterans Sam Mitchell (24 disposals) and Matt Priddis (10 tackles) were important in the tense moments late as the Eagles survived, while Elliot Yeo (22 disposals) rediscovered his dash and dare. Luke Shuey's work extracting eight centre clearances was crucial, especially in the final term, while Jeremy McGovern was a rock in defence again. The Blues can hold their heads high on the flight home. None were better than leaders Murphy (29, two goals) and Gibbs (26, one), but there are brighter times ahead for Carlton with young guns like Silvagni, Pickett, Charlie Curnow and Sam Petrevski-Seton promising plenty. West Coast: The Eagles suffered no apparent injury issues. 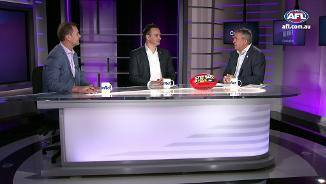 Carlton: The Blues also seemed to get through unscathed. The Eagles face a crucial road trip against the in-form Giants in a true test of their finals credentials. A loss could spell the end of their finals hopes if results go against them. 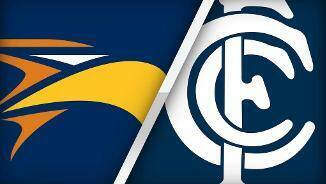 Carlton will be back at Etihad Stadium to host Hawthorn in the penultimate round.